Before I begin I'd like to point out that I take a pragmatic view towards the Bilderberg group, a view that sticks to facts rather than conspiracy-based claims. The facts are pretty clear. Each year, a powerful elite group of peoples from around the world meet in secret to discuss political issues around the world. The simple act of doing so counts as treason in several countries. Whether you believe in the conspiracy based views that the Bilderberg group is a shadowy group which controls the world depends on your own cognitive dissonance, but the facts are the facts. It is no conspiracy theory that the group exists, nor that the group meets in secret and nor that the group can spearhead major political and foreign policy without the consent of the public. Just two decades ago, to suggest that the European Union was preplanned since the second world war would lead you to be accused as being a conspiracy theory nut. One who must, automatically by default therefore also believe that the moon landings were faked. Now though, it has become explicitly obvious that these people were indeed right all along. Part of Wikileaks' catalogue of leaks included Bilderberg documents from the 1950's and 1960's. The earliest one being from 1955 is by far the most eyebrow raising for those interested in the European integration project. In the 1955 document a whole section is dedicated to 'European Unity' whereby the need for higher powers than a simple coal community were discussed as well as the need for a Euro currency. Remember, this is from over 55 years ago. It was in the 1970's when we were promised by our political leaders that the European Economic Community was purely only about a trade economic agreement and had no intention of becoming a political union with a common currency. 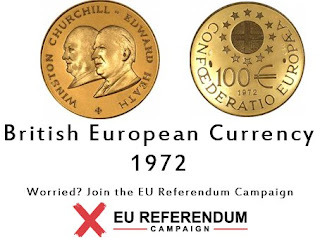 We were lied to by our politicians in the 1970's, they knew precisely what they were letting ourselves into. there is no question of eroding national sovereignty, there is no blueprint for a federal Europe.. Barely a decade later, Edward Heath admitted in an interview that he lied to the British electorate, that he knew that the Maastricht Treaty was a passport for a federal Europe with a single common European currency. The leaked 1955 Bilderberg document is further evidence that we have been lied to for decades about the European Union. It has gotten so bad that people are no longer bothered or surprised. I think even we in UKIP are guilty of this.